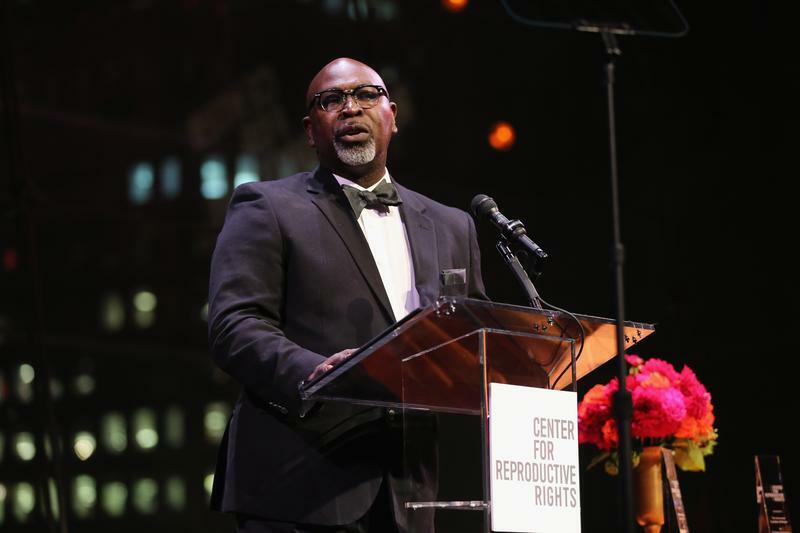 Dr. Willie Parker is a vocal advocate of safe abortions. Mary Harris: When you’re a patient in an exam room, there are things a doctor might say to fill the silence. Dr. Willie Parker: So I’ll say when you’re mom makes her collard greens does she put smoked turkey neck or neck bone in it? MH: Dr. Willie Parker is a master of soothing his patients with small talk. He’ll talk about Southern cooking. Sometimes he tries to rap for them. He’ll get them to laugh. Or remember, what was in those collard greens? WP: And by the time they figure that out the procedure's five minutes and it’s over. MH: He calls this technique verbocaine. And the procedure he’s giving -- is an abortion. The goal of his small talk, his verbocaine, is to help his patients feel fine and normal, like this thing they’re going through--it isn’t such a huge deal. WP: I’ll say okay, this is a thing in your life. It doesn’t define you and it doesn’t have to be a solemn processional. MH: He says many of the women who come and see him feel ashamed. Some don’t know how to feel. WP: For many of them, she’s the only one that she knows who’s had an abortion because women don’t talk about this. But I assure her there are women in your life who’ve had abortions that you don’t know anything about. Could be your mom, could be your aunt, could be Sister Jenkins at church. You know why you don’t know? Cause that’s their business, and this is your business. MH: I’m Mary Harris and this is Only Human. Today, what it’s like to be a doctor who performs one of the most controversial medical procedures there is. And a heads up, there’s some tape in this episode that’s pretty graphic. MH: Dr. Willie Parker lives in Birmingham, Alabama. Where he grew up. He moved back home two years ago because he wanted to practice in the south, where abortions can be hard to get. He travels from state to state, working in Alabama and Georgia, the clinic where he works in Mississippi is the last one left in that state. But for the first 12 years of his career as an OBGYN, Dr. Parker didn’t perform abortions. He wouldn’t because he was raised as a born-again Christian. MH: I want to get started by talking about how you got here. WP: The 1 train… I’m kidding, yeah I got you. MH: Before you started performing abortions, you spent 12 years as a gynecologist and you actually didn’t perform abortions. WP: Well I think the short story is, someone said when you wrestle your conscious and lose you actually win. So for me it was battle of conscience larger because of my religious upbringing as a Fundamentalist Protestant born-again Christian. So while I never questioned a woman’s right to make that decision I was conflicted about what that meant for me to provide. Had I not chosen women’s health as my speciality it wouldn't have been a direct values conflict. But becoming an obstetrician gynecologist and providing every other service for a woman except abortion, I felt conflicted when I knew what women faced and I knew what it meant when this service wasn’t available and I yet found myself unable to provide this service. MH: So what did you do, when you had a woman in your office and she was clearly considering an abortion….and you weren’t yet providing them? WP: Well, in my residency I received no abortion training. WP: I’m not trained… But for me that wasn’t enough. MH: Women were coming to him at their most vulnerable moment. It felt wrong to send them away and it started to weigh on him. WP: That crisis moment, that come to Jesus moment as I called it, came when one evening I was listening to a sermon by Dr. Martin Luther King where he takes the story of good samaritan and describes in his words what makes the good samaritan good. MH: The story of the good samaritan goes like this. A man on the road to Jericho was robbed and left for dead. Travellers kept passing him by, making excuses for not helping him. They said he might be dangerous and they were scared for their lives. But finally one man, a Samaritan, stopped to help. WP: Dr. King said while everyone else passed this person by and wondered what might happen to them, the good samaritan asked, what will happen to this person if I don’t stop to help him? And that resonated with me deeply because for me it brought into context what it meant to see women who needed this care and what it meant when they didn’t have it. MH: What did you worry would happen to the women that you were seeing if they couldn’t get an abortion? WP: I knew when abortions aren’t available that does not stop women from trying to accomplish that goal, taking matters into their own hands. Accessing medical regimens online or using folk remedies with no medical supervision, which potentially leads them to having complications that are unnecessary when abortion is safe and legal. MH: He decided that providing safe abortions was his calling. And to follow through, he had to completely change his life. MH: Did you lose friends? WP: I didn’t lose friends as much as people declared what their true roles were in my life. MH: That must have been hard though. WP: Well, I think there’s the--I’ve come to realize in my 53rd trip around the sun that what you feel will happen to you is usually far worse than what actually does happen to you. And I became quite comfortable with the fact that there would be people that choose not to be in my life. MH: By this time Dr. Parker had gotten a good job at a university. He left it to get trained in abortion care. Then he started practicing at clinics in the south. At first, he’d fly in to treat patients, and after years of that he decided to pick up and move back to Birmingham, where he still had family. MH: Why was it important for you to do abortions in Alabama and Mississippi? WP: Well, my humorous answer is that I decided to abandon the Harriet Tubman model of reproductive justice and so I was perched in the north or in the places I would live, I would swoop down to the south. But then I decided, I made women in the south a priority because of the abject of poverty, the disproportionate representation of African-American women in that poverty. I decided that knowing that reality first hand as a person born in the south and being reared in abject poverty, that I as a person of color who now had this skill, if I couldn’t women a priority who will? MH: The house where Dr. Parker grew up didn’t have electricity. He remembers learning to read by kerosene lamp. He was one of six kids raised by a single mom. But even though he was poor, he says he recognized early that he was privileged because he was a boy. WP: There were a lot of teen pregnancies in my community and pregnancies by unmarried women. If a young woman became pregnant and say she was singing in the choir. She was as we would say, sat down, or she was not allowed to perform her role in the church until she gave birth and then had to come back and publically apologize, for having had a baby out of wedlock. Now that happened to young women but I never saw the young man who got her pregnant have to stand before the church. That, to me, became blatantly obvious as an example of ways in which women were treated differently and unequally. Ironically in an institution where there should be no difference by gender. MH: Dr. Parker says providing abortions is all about giving women power over their own lives. After the break, we follow him inside the Mississippi clinic where he practices. A state law is threatening to shut that clinic down. I’m Mary Harris and this is Only Human. MH: I’m Mary Harris and this is Only Human. I’m talking to Willie Parker, a doctor who provides abortions in the south. Dr. Parker performs as many as two dozen medical and surgical abortions a day. And he says it’s impossible to generalize about the women who come to him for care. He learns their stories because Mississippi requires that women meet with a physician before they receive an abortion. MH: What types of circumstances do people tell you about when you’re in these counseling sessions? WP: Well, one of my patients that I always remember was a 35 year old woman with five children, the youngest of whom had recently succumbed to a childhood cancer. She said, I just don’t have the economic resources nor the emotional capacity to take care of another child at this time. So it’s that story, it’s also the 23 year old woman who’s on her way to law school and now is not a good time to have a baby. MH: I was struck when I read about your practice by the number of women who came to you and said, well I’m against abortion, but I just need one, now. WP: Some people say to err is human, I say to be conflicted is human. The harsh and the cynical person would call that the epitome of hypocrisy, but I would say, you can never say what you would do until you’re in the situation. So it’s not a matter of not holding them accountable for their concrete black and white thinking, but it is an opportunity to introduce nuance. MH: You’re a religious man. Do you ever talk about God? WP: I’ve had women sit up on the table and say, do you think God will forgive me for killing my baby? MH: What do you say? WP: Well, first of all I say that, number one, I don’t intend to speak for God, but what I would say to you that whatever you’re going to ask God to do for you you must first do for yourself, so if you feel like you need to be forgiven, before you can even feel worthy to ask God to forgive you, you first must forgive yourself. And I think, if nothing else, hopefully she will feel the capacity to cut herself some slack. MH: The clinic where Dr. Parker performs abortions in Mississippi, the one that’s threatened to being closed, is the subject of a short film by Maisie Crow, called The Last Clinic. Patients at Jackson Women’s Health Facility agreed to let the film crew spend time in the consult room, and the procedure room. MH: In this scene, you see that room’s sunny yellow walls, and a women’s legs, splayed, knees bent on an operating table. And you see Dr. Parker, as he’s about to remove a fetus from her uterus. WP: So, lot’s of pressure, relax. Try to relax that muscle. Very good so spectrum’s going in. Alright, little crampy. You’re doing great. You doing OK? You’re in the home-stretch, hang in there…. MH: What struck me watching the film of you at work... You really let the filmmaker in to everything. When you’re doing the procedure and then afterwards when you look at the contents of the woman’s womb and confirm that the abortion took place. And it just struck me that must be hard. WP: It’s not hard for me, and I recognize that it might be hard for some. But I’m clear headed about what I’m doing, I’m clear that abortion disrupts a life process. We’re ending a pregnancy. People ask the question of when does life begin, and does life begin at conception--no, life begins before conception, life is a process. You can’t have a dead egg and a dead sperm and get a live zygote. So, for me, I don’t argue that ending a pregnancy isn’t the disrupting a life process. But what I am clear about is when it comes to personhood, I don’t confer personhood on a fetus. So when a woman is making her decision, my obligation to her as my patient and as a person, allows me to prioritize her over the life process that is going on inside of her body. MH: The film The Last Clinic shows the protesters who confront Dr. Parker as he comes in for work. MH: Dr. Parker says he still considers himself a Christian. And he thinks it’s important to stand up to people who call him and his patients immoral. So he doesn’t shy away from conflict. MH: You’re not just providing the services, you’re writing op-eds, you’re letting filmmakers film you while you’re doing the procedure. Why be so outspoken? WP: I decided that criminals act like criminals, they hide and they obscure things when they know they’re doing wrong. I don’t have any moral misgivings about the work that I do. I believe my work is honorable, I believe it is necessary, I believe it is always appropriate to help people, and so I’ve made the conscious decision to practice my craft with the dignity and honor that I think it is due. In some ways when you’re doing something that’s liberating and lifesaving for people there’s really no clandestine way to do it. MH: There are serious risks that come to his work. We talked only a few weeks after a shooting at a Planned Parenthood clinic in Colorado Springs that left three people dead. He shifted to doing abortions full-time in 2009, the day after George Tiller, an abortion provider in Kansas, was murdered. MH: The work you do is dangerous. How many times have you been threatened? MH: Hard to find humor in that. WP: Well, when people often confront me with the mortal risk of the work that I do, I say life is dangerous. Life is fatal, no one is getting out alive. But if you don’t have something you live for and you’re convicted by, and if that conviction isn’t deep enough for you that it may lead to somebody wanting to harm you or kill you for it, then you’re already dead. MH: Did you take any precautions to protect yourself? WP: Yeah I look both ways before crossing the street. WP: You know, people have asked me about a vest and that kind of thing. You know, there’s no such thing as all-over kevlar body armour when every portion on your body is protected from a gunshot or something. I would wear a vest if it would provide me with some sense of security and safety but because it doesn’t I’m more vested in the common sense measures that I take. MH: He tries to keep his schedule from getting too predictable, and uses a rental car sometimes so he won’t be noticed. This year the Supreme Court will hear its first major abortion case in almost 10 years. The court will weigh in on a new kind of law that’s passed in many states in the south and across the midwest, including the states where Dr. Parker practices. The law is focused on what are called admitting privileges. They require that doctors providing abortions be able to admit patients at a nearby hospital. That’s more of a hurdle than you might think. To get admitting privileges, a doctor must apply to the hospital and be vetted and approved, and hospitals don’t have much incentive to go through that process for abortion providers since few abortions result in hospitalization. It’s one of these laws that could close Mississippi’s last clinic. It’s the Texas version of this law that goes before the Supreme Court this term. MH: Because of these cases--the Texas case, the one in Mississippi--does it feel like an especially contentious time to practice? WP: When I was growing up as a kid, and the older people who were monitoring civil rights law when there would be a set back, the older women in my community would say, baby in times like these there’s always been times like these. So I draw from that parallel with regard to access to abortion. In the last three to five years there have been more rules passed at the state level to restrict access to abortion than in the previous thirty years, so it feels like a contentious time but there’s never been a day since Roe passed where women haven’t had to struggle to maintain access to this vital healthcare. MH: That was Dr. Willie Parker. He’s an obstetrician gynecologist who provides abortions in the south. Maybe you’ve had to decide whether or not to have an abortion. If it’s an experience you’ve gone through, what was it like? Has it affected you personally or politically? Tell us about it. Write us, or send us a voice memo at onlyhuman@wnyc.org. Only Human is a production of WNYC Studios.This episode was produced by Julia Longoria and edited by Molly Messick. Our team includes Paige Cowett, Amanda Aronczyk, Elaine Chen, Kenny Malone, Fred Mogul and Ankita Rao. Our technical director is Michael Raphael. Our executive producer is Leital Molad. Jim Schachter is the Vice President for news at WNYC. I’m Mary Harris. Talk to you next week.